In the Shadows. 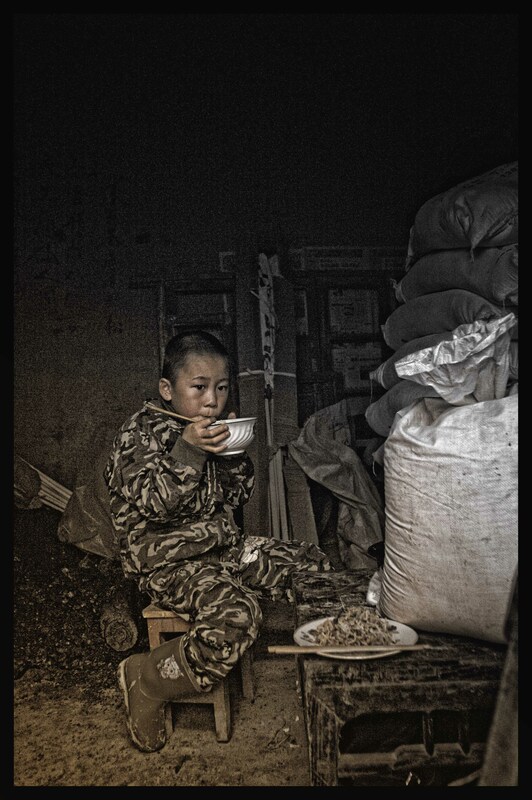 Image taken in Shaanxi Province China during a three day wedding celebration in a remote village north of Xian. This little boy was the son of one of the villagers who was helping prepare wedding meals for all the villagers and wedding guests. These villagers catered for well over 500 people three times a day for three days starting around 4am each morning and finishing late in the evening / early morning depending on how much alcohol is consumed 🙂 The young boy was sitting alone with his bowl of soup noodles and stir fried vegetables, enjoying the peace and quiet and the wonderful lunch brought to him by his mother. Very sympathetic portrait Mark, and with a gentle transition of lighting, considering that he seems to occupy a dark corner….your photos are always satisfying and enjoyable.